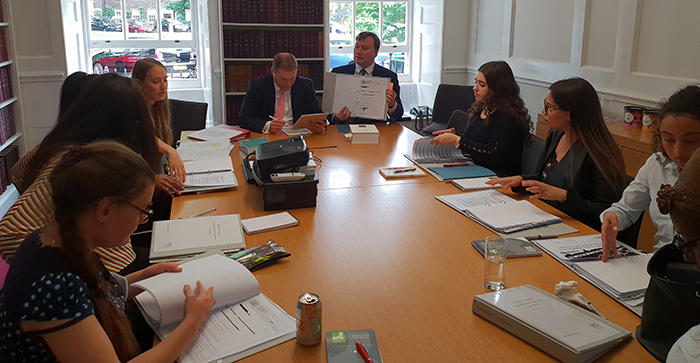 Radcliffe Chambers, the London-based chancery set, has held its first ever law camp for sixth-form students from under-represented groups in the latest attempt to diversify the bar. Earlier this week, Radcliffe’s Student Law Camp hosted a series of workshops giving a brief overview of the different aspects of legal practice — from advocacy to drafting wills. Ten lucky students, chosen from 80 applicants in partnership with Big Voice London, a UK Supreme Court-backed charity aimed at engaging young people in law and legal policy, were given a whistle-stop tour of what is on offer in a career in law. The programme, which took place over two days, aims to widen access to the bar by filling a knowledge gap which students from under-represented groups, without family connections, might have. As part of this, the camp emphasised the importance of interview skills, a strong CV and explained the various routes into the profession. Perhaps the most interesting experience for students, however, was to be paired with barrister mentors during the camp. Not only were students able to chat with individual barristers over a Domino’s ‘Two for Tuesday’ lunch, but they were encouraged to approach their mentor again in the future with law-career related questions. The camp also intends to humanise the bar in the face of negative perceptions among young and under-represented groups. Sixth form student, Lorena, for example, said that prior to the camp her notions of a career as a barrister were that it was “for the high class — inaccessible and non-achievable”. According to Radcliffe barrister Katherine McQuail, this was exactly the stereotype the camp sought to break down. She emphasised that if there is any hope to increase diversity at the bar, it needs to be demonstrated that “barristers are approachable, human beings and within reach”. Radcliffe has specifically targeted sixth-formers rather than undergraduates because it is hoping to catch the next generation before they have made up their minds and cast their die in a particular direction. Barristers in attendance were keen to stress that work ethic is as important as which university you go to. Senior barrister, Kate Selway, commented: “providing a student works hard, is passionate about their subject and gets a good degree”, they should not rule out the bar. The post Chambers ‘Law Camp’ gives sixth-formers a taste of life at the bar appeared first on Legal Cheek.